Pictured L-R: Sam Lorber, Instructional Designer, Pearl-Cohn; Susan Stewart, The Recording Academy South Regional Director; Jeff Balding, Current President of the Board of Governors of The Recording Academy Nashville Chapter and P&E Wing Pearl-Cohn Subcommittee co-chair; Julian King, P&E Wing Sub-Committee co-chair; Maureen Droney, Senior Executive Director, P&E Wing; and Laurie T. Schell, Music Makes Us, Metro Nashville Public Schools, who comprised the panel "Pearl-Cohn High School: A Case Study of Collaboration Between Industry and Education," at the recent AES 50th International Conference at Middle Tennessee State University (MTSU) in Murfreesboro, Tennessee. Photo by Robert Clyne, Clyne Media Inc. Photo courtesy of The Recording Academy®/Clyne Media Inc. © 2013. 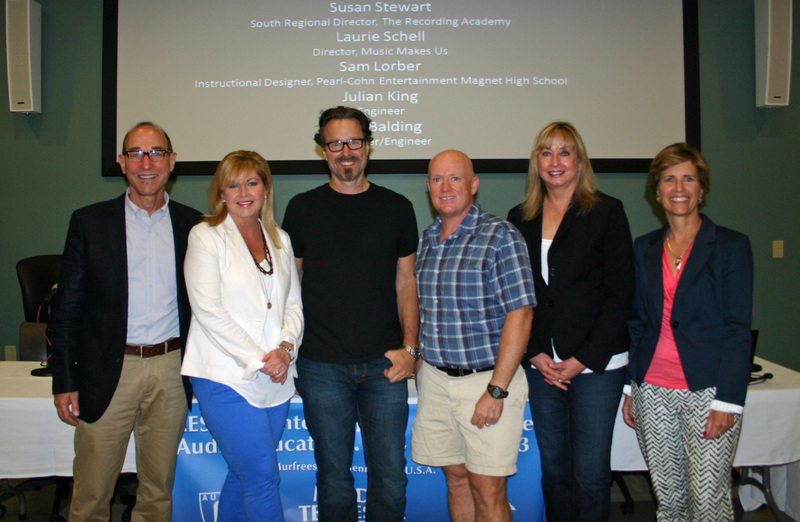 SANTA MONICA, Calif. (August 5, 2013) — The Recording Academy® Producers & Engineers Wing® had a strong presence at the Audio Engineering Society (AES) 50th International Conference, held July 25-27, 2013, at Middle Tennessee State University (MTSU) in Murfreesboro, Tennessee. It was the first such conference dedicated specifically to audio education, and P&E Wing members joined more than 140 educators and industry representatives, who met there to exchange ideas and experiences. Attendance far surpassed the organizers' initial expectations, with attendees traveling to Murfreesboro from twenty-five U.S. states and twelve countries, including Korea, Japan, Australia and New Zealand. Of special note was the first panel of the conference, "Pearl-Cohn High School: A Case Study of Collaboration Between Industry and Education," presented by the P&E Wing. This panel focused on the recent creation of a recording studio and recording technology program at Nashville's Pearl-Cohn Entertainment Magnet High School. The presentation covered the many elements that came together in this project, from studio design, build out and equipment, to the collaboration with manufacturers, local government and the Metro Nashville Public Schools' music education initiative, "Music Makes Us." As the panel demonstrated, in today's world, where obtaining funding for arts education is often a struggle, the implications of this pioneering project for the school, the Nashville music community and the wider industry are monumental. The panel included multiple GRAMMY® Award nominee, current President of the Board of Governors of The Recording Academy Nashville Chapter, and P&E Wing Pearl-Cohn Subcommittee co-chair Jeff Balding; P&E Wing Sub-Committee co-chair and producer/engineer Julian King; Instructional Designer for Pearl-Cohn, Sam Lorber; Music Makes Us, Metro Nashville Public Schools representative Laurie T. Schell; and Recording Academy South Regional Director Susan Stewart. The panel was moderated by P&E Wing Senior Executive Director Maureen Droney. Metro Nashville Public Schools' music education initiative, "Music Makes Us," provides students at Nashville's Pearl-Cohn Entertainment Magnet High School with a student-run record label mentored by Warner Music Nashville and a complete world-class recording studio designed, equipped and guided by the efforts of P&E Wing members. Music Makes Us is a joint effort of Metro Nashville Public Schools, Mayor Karl Dean and music industry and community leaders. The Music Makes Us initiative will lead the nation in music education. With a focus on music literacy and student participation, Music Makes Us is strengthening traditional school music while adding a contemporary curriculum that embraces new technologies and reflects a diverse musical landscape. Photo Caption: Pictured L-R: Sam Lorber, Instructional Designer, Pearl-Cohn; Susan Stewart, The Recording Academy South Regional Director; Jeff Balding, Current President of the Board of Governors of The Recording Academy Nashville Chapter and P&E Wing Pearl-Cohn Subcommittee co-chair; Julian King, P&E Wing Sub-Committee co-chair; Maureen Droney, Senior Executive Director, P&E Wing; and Laurie T. Schell, Music Makes Us, Metro Nashville Public Schools, who comprised the panel "Pearl-Cohn High School: A Case Study of Collaboration Between Industry and Education," at the recent AES 50th International Conference at Middle Tennessee State University (MTSU) in Murfreesboro, Tennessee. Photo by Robert Clyne, Clyne Media Inc. Photo courtesy of The Recording Academy®/Clyne Media Inc. © 2013.